To follow up on my blog post I wrote for the Graziadio Voice about learning and applying Appreciative Inquiry (AI) as a large group intervention while in Costa Rica with my graduate program in Organization Development, I’m happy to share more details about my experience designing team-building retreats with two local organizations. 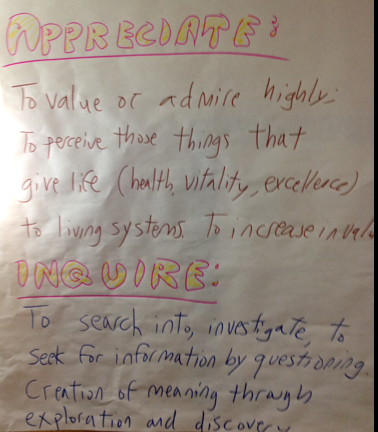 I also want to use this post to share more details about the Appreciative Inquiry process. The two organizations I used AI with are the Long Beach Alliance for Children with Asthma (LBACA) and the Long Beach Pride. Special thanks goes to the Long Beach Nonprofit Partnership that connected me to these organizations. I’m happy to serve as an Affiliate Consultant for LBNP. According to Appreciative Inquiry: Change at the Speed of Imagination, the AI Process has five phases. Below are quotes from the book and additional information about how I facilitated these phases with LBACA and Long Beach Pride. 1. “A Definition phase during which the inquiry goals, including the framing of the question and the inquiry protocol, the participation strategy, and the project management structure are developed.”: Prior to both retreats, I worked with leadership from both organizations to identify the goal of the retreat. And for each, I interviewed retreat participants prior to the retreat (something I always prefer to do because it gives me an opportunity to hear from everyone, listen to their perspectives and build an engaging agenda that reflects their feedback). 2. 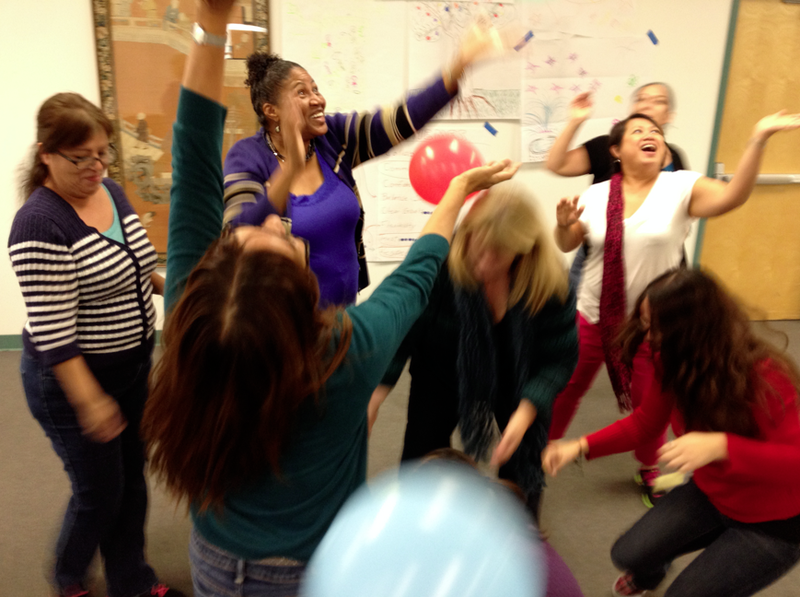 “A Discovery phase during which members from the system develop an in-depth understanding of (a) the “life-giving properties “ that are present in those exceptional moments when the organization is performing optimally in human, economic, and organizational terms and (b) of the structures, dynamics and other associated conditions that allow those “life-giving properties “ to flourish.”: I asked staff to pair up and share stories with each other for when they felt the experienced teamwork at its best. This activity aims to bring real stories of success to the forefront and then give the group the opportunity to explore the ingredients for the success. In groups of four, I asked participants to generate common themes they heard and then together as a large group, we prioritized the elements people thought generated the most positive momentum. 3. “A Dream phase during which system members create shared images of what their organization would look, be, feel, and function like if those “exceptional moments” and the “life-giving properties” in the system became the norm rather than the exception.”: This is where the creative energies flourished during the day. Also, at this point in the day, the positive momentum really started growing. 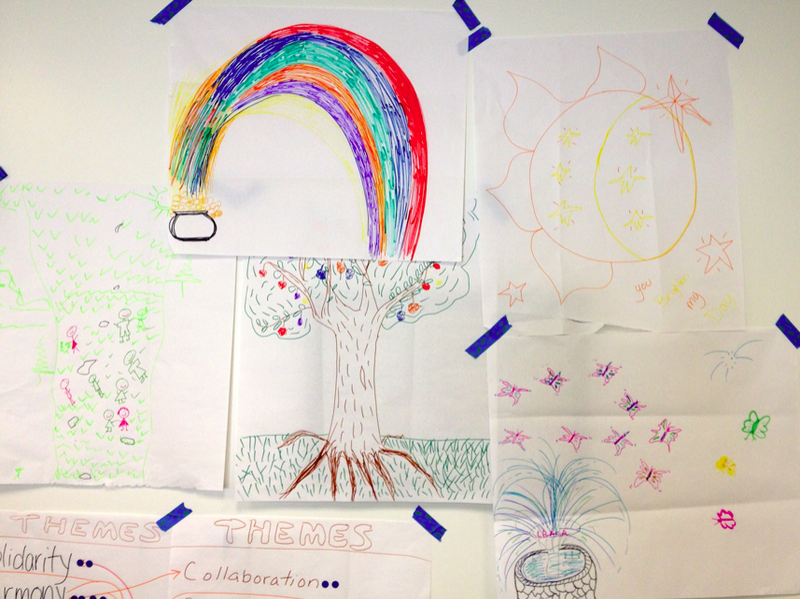 I gave instructions and participants created a shared images of what their organization would look, be, feel, and function like if those “exceptional moments” and the “life-giving properties” in the system became the norm rather than the exception”. After brainstorming several ideas, participants split up into smaller groups and created an image capturing the possibility of the group along with a statement. 4. 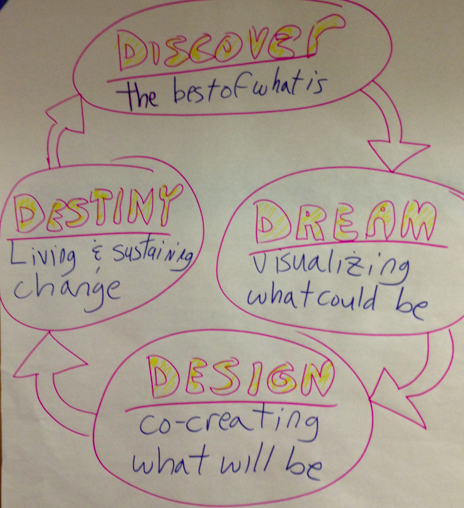 “A Design phase during which system members agree on the principles that should guide changes in the organization’s sociotechnical architecture and develop the details of whatever changes are thought to be needed, based on the previously articulated guiding principles.”: I facilitated a conversation asking how the group can support each other to make their dream reality. Since the group sat around a large table, I literally invited the group to “put things on the table”, things the group needed to discuss in order to make their dream reality. 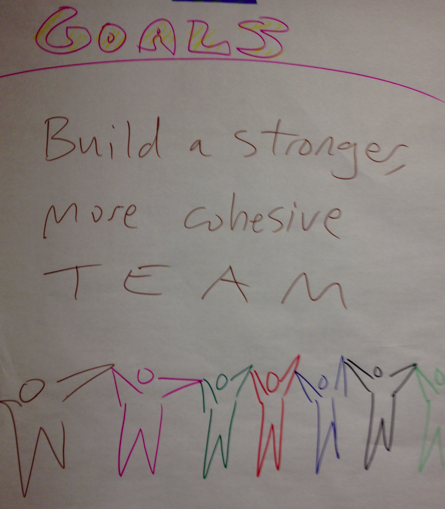 I ask the group to think of three things: what commitments can they make? What gifts to they bring? What requests do they have? 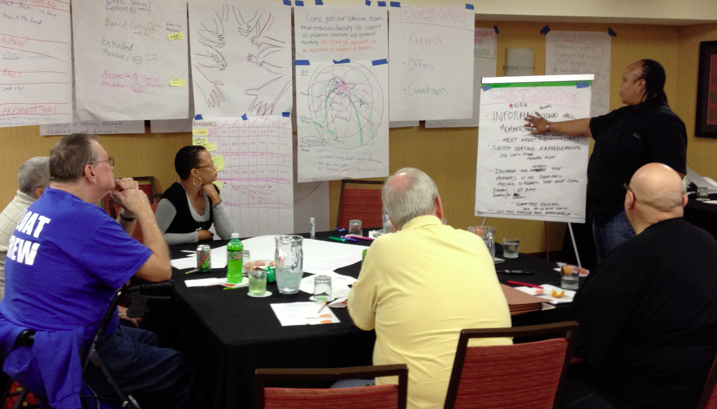 I then facilitated a dialog where the group was able to develop a design for moving forward. 5. “A Destiny phase, sometimes called the Delivery phase (and more recently the “deploy” stage), during which the organization evolves into the preferred future image created during the Dream phase using the work done in the Design phase.”: For this, I inserted a fun activity/challenge, keeping as many balloons in the air as possible (something I’ve incorporated in other team-building retreats). The difference is going through this activity after going through the AI process is that I asked the group to reflect on how they worked as a team and relate it back to their possibility image and statement. This simple exercise gave participants a very real work example of actually putting their design into practice. Since a retreat is really only a beginning and not an ending, I closed the retreats asking participants to share one commitment they could make over the course of the next month to make their dream reality. What’s powerful about the AI process is that each step builds on the previous one and creates a positive energy for moving forward, based on real success in the past. 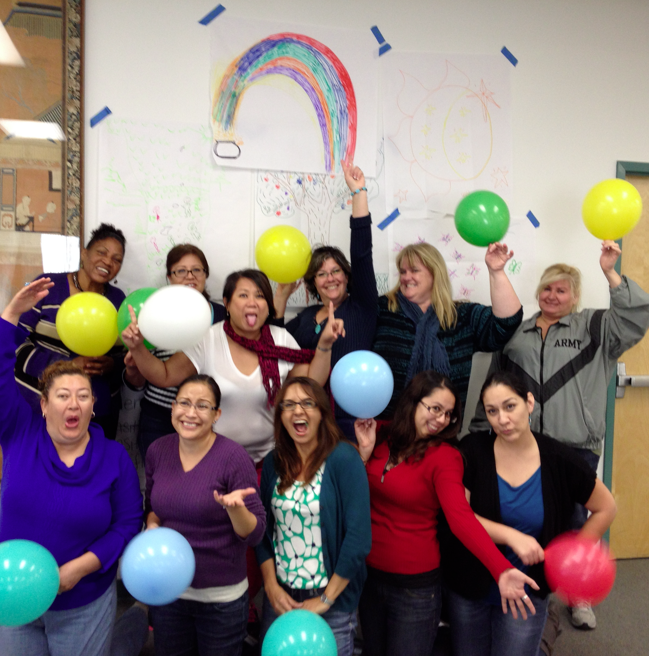 It helps groups recognize and clarify their possibilities, but then give them the tools to make it happen. The AI process also gives groups the opportunity to have crucial conversations that build the foundation for changing the organization’s culture in a positive direction. While we used this process to strengthen teams, it has a much broader set of applications for a wide-range of possibilities. This entry was posted in Retreats and tagged #Nonprofit, Board Development, Clients, Collaboration, Community, Facilitation, Leadership, Leadership Development, Retreats, Staff, Team Building. Bookmark the permalink.